*We are looking for volunteers! Please sign up to join our volunteer sort here! 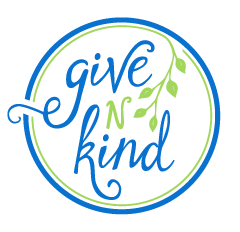 giveNkind is working with Gratitude Generation to host a donation drive of items you already have at home that you no longer use. These items may not be serving a purpose for you but can fill a critical need for nonprofit organizations serving our community. Please only donate clean, usable, working items in good condition and without missing or broken parts. The items will be sorted by the Gratitude Generation student volunteer team and packaged to be delivered to nonprofits across Chicagoland. Donations can be dropped of Saturday, December 1 from 9 a.m. - noon. Donations can also be dropped off at These donations aren’t being resold, but instead will live another life in the hands of those who need it most. To be a drop off location, help with the drive, or to make a donation, email contact@givenkind.org. Giving to giveNkind kind is truly the gift that keeps on giving. With your monetary gift of support, giveNkind can continue to help put new and gently used items in the hands of nonprofits who need them to fulfill their mission in our communities. For every $1 you give, we are able to place $6 worth of goods in our 40+ nonprofit partners. We are unique in that we have a number of different ways that we connect donors and nonprofits such as donation drives, online listing and connecting of goods, and donation of new goods from large vendors through ShipBob. We are also different because we facilitate the giving of both new and gently used items! Our goal- to expand what it means to give. Your gift can help us expand our reach!